The Greek word "calligraphy" translates to "beautiful writing." Calligraphy allows you to create gorgeous wedding invitations, pretty cards, or special documents. If you're just learning how to write calligraphy, or if you need a different style, a calligraphy template can help you get the results you desire. There are two types of calligraphy templates: full alphabet templates and downloadable fonts. 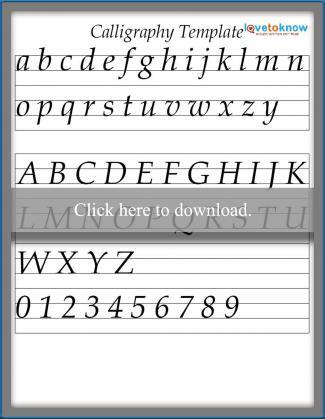 Alphabet templates are guidelines for making individual letters and are easy to find online. 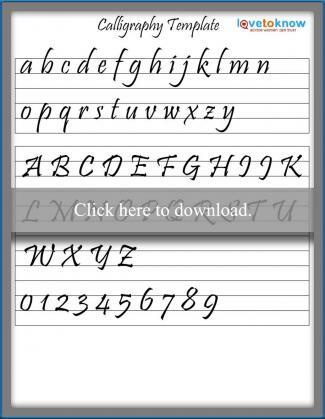 They may be the most effective way to learn calligraphy because you are practicing each letter. However, alphabet templates can also be inconvenient, especially when you want to change the letter's size or create a longer message. Downloadable calligraphy fonts can be customized to be the size you need. Use your computer to create the message and layout you have in mind. 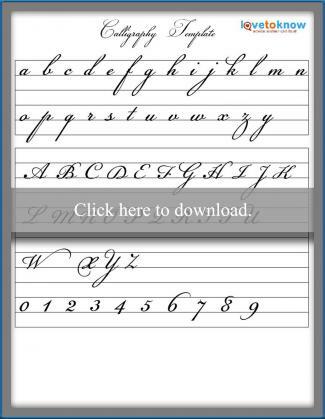 Then, print the document and copy it by hand using calligraphy. The main disadvantage of this option is that it won't help you learn individual letters. You can download and print the following templates for free. Each one contains a full alphabet in upper and lowercase as well as numbers. Click on your chosen font to open the downloadable PDF file. Check out these helpful tips for help downloading the printables. Click here to download this template. 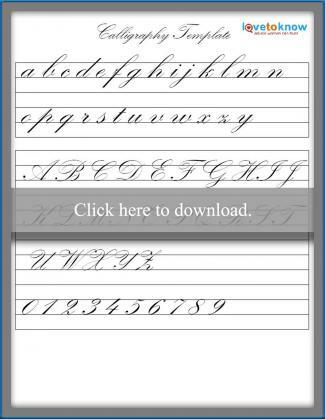 Calligraphy Alphabet offers multiple printable sheets in Cursive, Gothic, English, and Fancy styles. Search by letter to get exactly what you need. Calligraphy Skills has numerous alphabets and tutorials for printing for personal projects. Love Paper Crafts offers downloadable practice sheets for both upper and lowercase letters using modern calligraphy. The practice sheets work as templates as well. 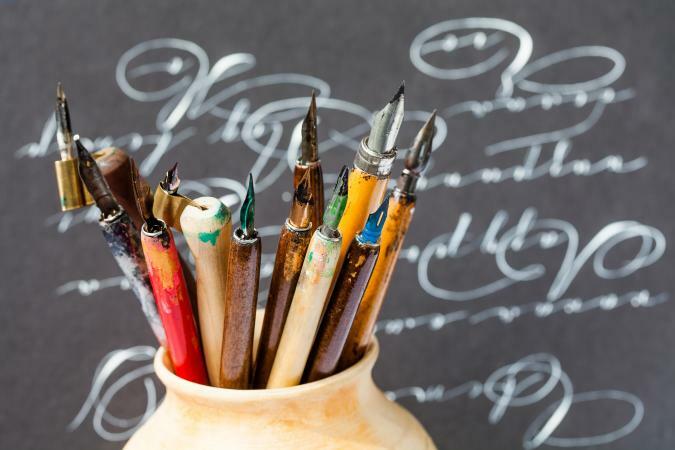 Calligraphy Alphabets has a great selection of free calligraphy fonts in the public domain. This means you can copy and use them free of charge. You'll find a variety of fun lettering styles. FontSpace has over 600 fonts free for download. They work on both Windows and Macs and are resizable. Urban Fonts has pages of downloadable, free fonts. Search by type or style, or even input your own text to see what it will look like. 1001 Free Fonts has pages of downloadable calligraphy fonts available for both Mac and Windows. Noupe has 10 free downloadable calligraphy fonts that can be resized and styled for any project. Font River has over 30 pages of free, downloadable calligraphy fonts. Print the letters onto cardstock and cut them out. You can now trace the letters again and again until you get used to the way your hand should move. Place cutouts or prints of the words or letters you are using right in front of you as you work. This will allow you to have quick and easy reference. Print out the letters onto stiff plastic sheeting and use an X-acto knife to cut them out. You now have a stencil to work from that can be used again and again. With its long history and complicated appearance, calligraphy can be quite intimidating to beginners. However, with the help of calligraphy templates, you can use this beautiful art to enhance your cards, envelopes, scrapbook pages, and any other documents. As with any craft, the more you practice the more proficient you'll become.